La la la…do you hear that? Sort of sounds like the wind. Some kind of really annoying wind. Actually, I don’t hear anything at all. Misery, by Stephen King, is a decent scary story about a guy held captive by a deranged woman, and for most readers, and anyone who’s only watched the movie, the plot is the key. What always struck me as most interesting, though, was King’s discussion of the writing process. The movie more or less glosses over Paul Sheldon’s process, while the book not only contains big chunks of several of Sheldon’s novels, but also provides a wonderful description of what it feel like to be a writer “in the zone” (Google Mihály Csíkszentmihályi to learn more about this concept), how the creative process unfurls, and what the art of writing feels like and means. One of the metaphors King uses to illustrate Sheldon’s ability to survive is the game of “Can You?” a competitive form of storytelling the character played as a child, which involved making up stories with cliffhangers, then tagging the next player to help the character escape his predicament by continuing the story is a believable way. The other player then voted on whether or not they bought this section of the story: Can you? Sheldon always could, and, as he struggles through his ordeal, he realizes he is playing a real life version of Can You? and that yes, he can. This is one way of looking at the creative life: every day is a game of Can You? If, every day, you play the game, most likely, you find that you can. If you can’t, you probably give up and do something else. But if you can, it sustain you even when the snake slithers around hissing insults in your ear. When you remind yourself that you can, it’s easier to ignore the ones who keep saying you can’t. 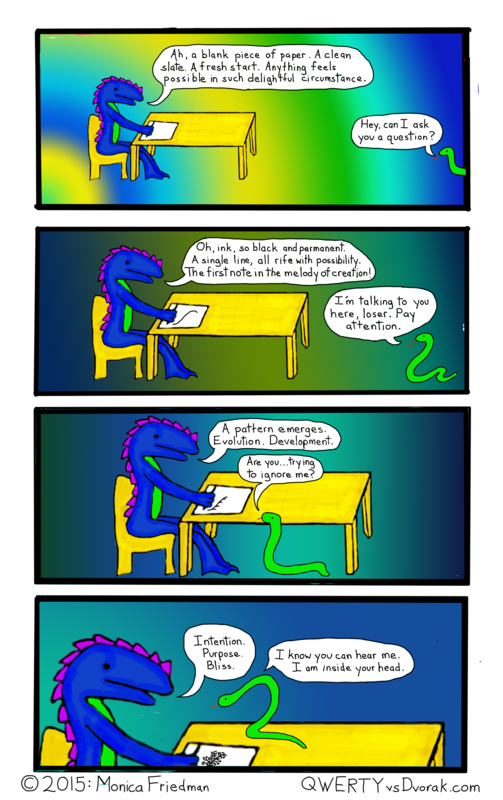 This entry was posted in Comics, dragon and tagged dragon, ignoring, insults, persevering, snake, webcomic on January 12, 2015 by littledragonblue.